There are plenty of puzzle games available, and plenty more are being added each day, but there are not that many color-based puzzle games that can take a simple mechanic to the next level. 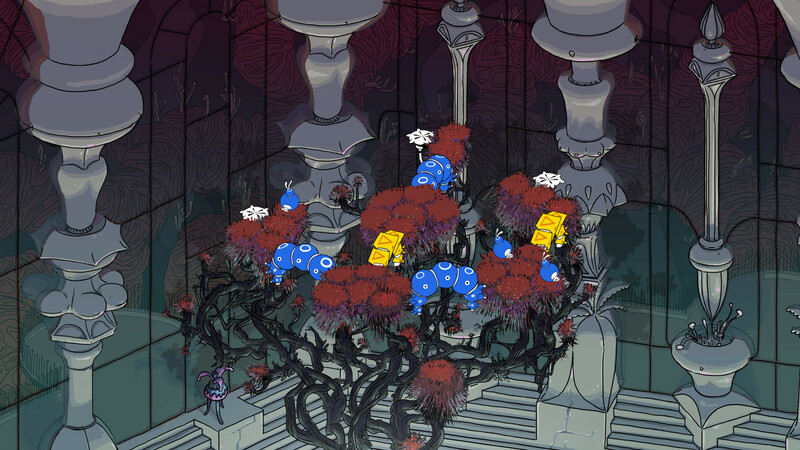 There are certainly not that many puzzle games in a hand-drawn fungipunk fantasy world, with a confusingly heartbreaking tale about love and losses. She Remembered Caterpillars seems to be having it all, so let’s dive into it. The storyline in She Remembered Caterpillars isn’t really a storyline, it’s more of a tale of memories and the present day that is being told in-between the levels. The tale being told is that of Nadir and her relationship with her father. It begins with Nadir being younger and talking to her father about death and what it entails. She loves her father, regardless of his bad decisions and lies, and she doesn’t want to lose him. Whilst their relationship has grown strained over the years that follows it, her father has fallen ill. We soon find out that Nadir simply doesn’t want to give up on her father, and she dabbles in experiments with gammies (genetically altered micro-mycoparasites) that might save him. Will she be able to rescue her father from whatever ails him, or will she learn to let him go? Described featuring an unsettling fungipunk aesthetic, the hand-drawn world of caterpillars, vibrant gammies and other living fungi and flora is simply stunning. 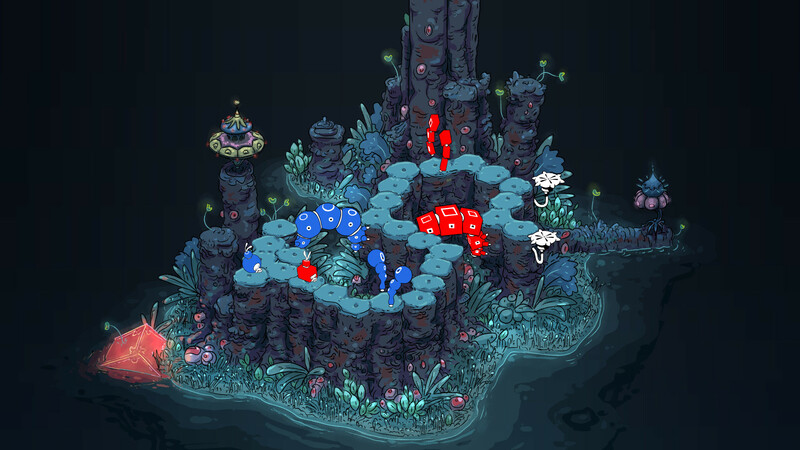 Each act is unique in its own way, with different color combinations and backgrounds, adding gloom and doom strengthening the storyline even further as the levels become gradually darker. In a way, the visuals seem apocalyptic, but it really works well with the vibrant colors. Although there is some sort of storyline embedded in the game, there are no voice-overs for the dialogues of past and present times. Whilst this is certainly not a necessity, it could have been a nice touch to have a soft narrator in-between the scenes. The ambiant soundtrack is a mixture of soft chimes, various critter calls and water sounds, making it a very soothing soundtrack during those flabbergasted moments. The movement of the gammies is boldened by having loud thunderous thumps. 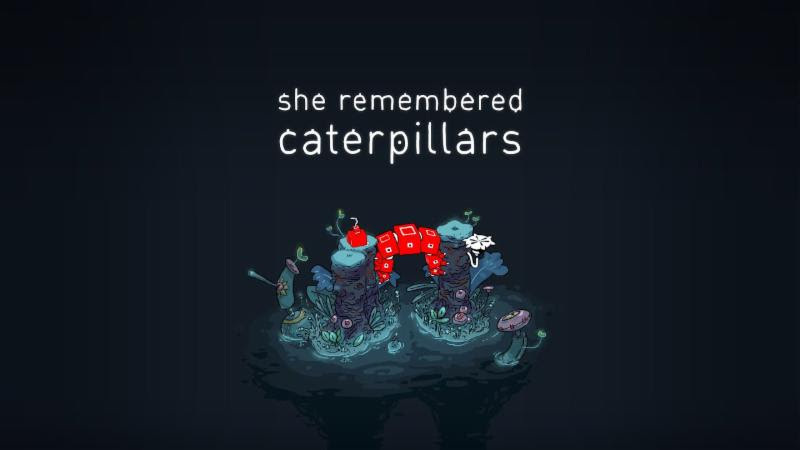 She Remembers Caterpillars is a puzzle game that was originally released on PC in 2017, but now it has been released on Nintendo Switch, which allows the usage of the touchscreen. If you don’t want to use the touchscreen, you can always play with the Joy-Con. With the left stick you can move the characters, switching between the characters is done with the L or R buttons whilst merging or splitting characters can be done with Y. The controls are simple, and the puzzles start off slow, so the learning curve is low, but the difficulty ramps up rather quickly. Each level features an island, with colored and patterned bridges and pillars, as well as sprites (or gammies as they are called) that feature the same colors and patterns. There are also platforms or launch pads, on which you will need to position one of each character to move onto the next level by having them fly away. Whilst this sounds like an effortless task, there are some “rules” in how the characters can move. 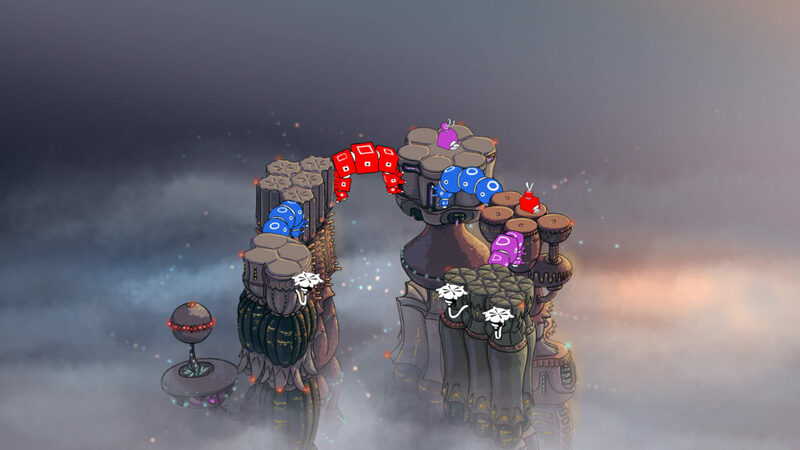 A character with the same color and pattern as the bridge can move across the bridge but cannot move past the pillars. Likewise, a character with a different color and pattern as the bridge cannot pass it, but it can pass the pillars. Describing the rules of movement makes it sound very elementary, but it becomes a complicated effort of trial and error as soon as more colors and patterns are introduced. What is helpful however, is the merging and splitting mechanic. This mechanic allows you to merge two gammies of different colors and patterns, to form one with a new color and pattern which you can use to cross even different bridges and pillars. There is not much replayability but the puzzles will distract you for quite a while and after some time has passed, they’ll simply bewilder you again. She Remembered Caterpillars is an excellent game in terms of authentic hand-drawn visuals and relaxing soundtracks. The mechanics are interesting considering that this is a simple color-based puzzle game and the difficulty ramps up fairly quickly, each new mechanic building upon the last one the game introduced. It can be a great game to play with young children, or even with some friends, as the levels require trial and error, until you’ve finally found the solution. If you like puzzle games with a meaningful storyline, we’re not entirely sure if this one would fit seeing as the storyline is confusing, jumping back and forth in past and present times without really telling the full story. This does mean that it is open to interpretation, which is an aspect theory-crafters may love. All-in-all, it’s a gorgeous game from start to end.